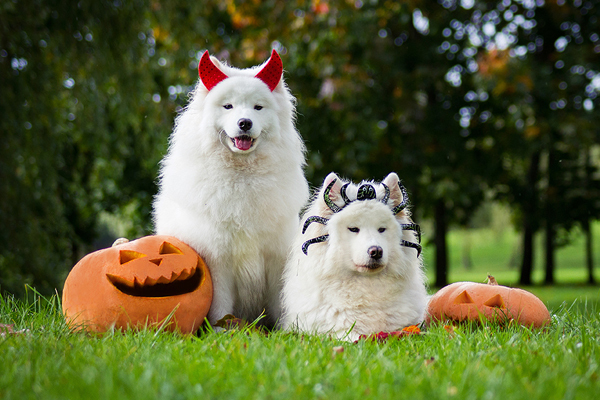 Halloween Fun from a Pet’s Perspective - Richell USA Inc.
Days are becoming shorter, leaves are turning vibrant hues, and there is a hint of chill in the air. Nature is telling us that fall is here and Halloween is just around the corner. Kids are busily preparing and comparing what they will wear on All Hallows’ Eve, all while contemplating how big their candy bucket will be as they traverse neighborhoods in search of the perfect trick- or-treat loot. While we tend to focus on what the kids will be doing for Halloween, dressing up your pet, taking them trick-or-treating, playing games or teaching them a new trick can be part of the Halloween fun as well for the entire family. How can you make it fun for your pet? And what are some of the best ways to enjoy trick-or-treat time with your furry friends? Keep reading for the spooky answers. Your pet will most likely tolerate a colorful collar or ribbon that goes around the neck, since most pets are already used to wearing a collar, according to The Nose Print. If you would like to dress your pet up a little more than that, one option is a costume that only covers part of your pet’s body, such as a tutu or skirt around the animal’s hip. This provides better ventilation compared to covering your pet completely, which could make them too hot if it is warm outside or your pet is overly excited. The article also says to not put anything over your pet’s whiskers, eyes, nose or mouth, because this will restrict the pet’s ability to sense what’s happening around them and lessen their ability to communicate. And make sure that your pet is still able to go potty without any hindrance. What if your pet is shy or afraid of door bells? The article answers that question with: Halloween training! If you start several weeks in advance, you may be able to teach your pet to be comfortable with the sound of a ringing doorbell. Record the door bell, play it at low volume, and give your pet a treat. Repeat this three to four times and then break for a couple hours. Then do it again. Once your pet looks for treats at the sound, turn up the volume slowly. Eventually, build to the actual doorbell ring and the opening of the door. After all, it’s time for some fun, so let’s make it even more memorable with your pet! Pets want to be with us…bottom line. 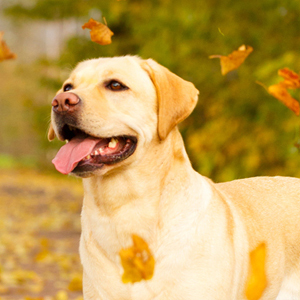 Take your furry companion Pet-o-Treating. That’s right; pets can go trick-or-treating as well. Each time the kids get a treat at a house, plop a pet treat in your pet’s bucket and your pet can enjoy the experience as well. Another important thing to remember is to keep your pet’s ID or microchip up-to date, especially if you are planning to go trick-or-treating with them! Lastly, no human candy or other goodies for your pet! How about a few minutes of hide-n-go-treat! Yep, just like it sounds, this game of sniff out and find the treat is a blast. Similar to our human hide-n-go-seek, this game involves hiding treats and is super fun for pets. To spice things up, make it harder as you go along by hiding treats in more difficult to find places. 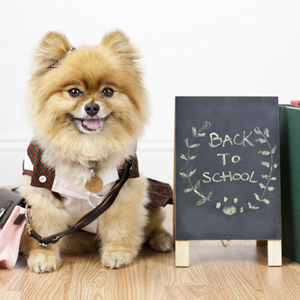 Between doorbell rings, teach your pet a new trick or remind them of an old one. In keeping with the Halloween theme, see if they will roll over and play dead. Be sure to have a bunch of pet friendly treats to reward their hard work. Richell’s Halloween Pet Costume Photo Contest! Submit your favorite pet photo and you will be entered in a drawing for an Elegant Wooden Pet Feeder or Elegant Wooden Pet Toy Box (Medium). Pets with the most Halloween spirit can win a Richell Elegant Pet Feeder or Pet Toy Box! Promotion expires 11/2/2018. A winner will be announced 11/5/2018. This promotion valid within the continental U.S. only. Richell USA will not share your information with any third parties.